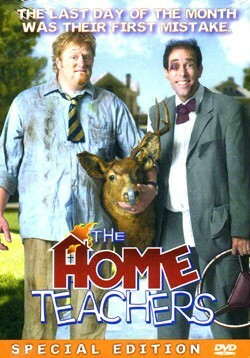 The Home Teachers is really the worst LDS movie I have ever seen. This was supposed to be a comedy (with influences from such classics as Planes, Trains, and Automobiles and Tommy Boy), but it was quite painful to watch all the way through. It had a pretty good start, but it continued like its own car crash scene--down and off the hill. It has got to be pretty bad when people leave the theater during the movie and don't come back! It's really a shame, since the story did have a pretty decent message to it. The story pairs Greg (Michael Birkeland of The Singles Ward and The R.M.) and Nelson (Jeff Birk of It's Latter-day Night!) as home teachers (LDS teachers who go out to minister each month to the various needs of those in their local wards); both are complete opposites. Greg is a slacker who waits until the very end of each month to fulfill his service. Nelson is the die-hard new guy, who is zealous to fulfill "every letter of the law." When he first meets Greg at the ward, Nelson can't wait to fulfill his whole duty with him of seeing everyone on their list. The problem is that Nelson is fixated on doing it all on this particular Sunday at the end of the month. Greg would rather run home and spend the day watching football, fulfilling their teaching duty next month. Fortunately for Nelson, he has the backing of Greg's wife (you'd think she'd have the priesthood! ), so Greg and Nelson take off for a Sunday full of adventure in home teaching. As expected, everything goes wrong. Disasters follow them wherever they go. But things finally go much better at their last house. They put in their time with elderly Sister Shoeman, and start to leave. Greg, though, feels like something isn't right--like they were missing out on something. So they go back and find Sister Shoeman in tears over her dead dog that she hasn't been able to bury. The guys end up really ministering to her, and at the end of the day, learn some important lessons from following the Spirit's lead. There really is a joy in giving to others out of a heart that is following the Spirit of the law rather than the letter of the law. Now of course the point can be perverted as LDS often notoriously do in letting their "burning bosoms" dictate their religion. But nonetheless, we do need to be sensitive to the leading of the Spirit in not omitting "the weightier matters of the law" (Matthew 23:23). Finally, for more reviews and information on The Home Teachers, click here.